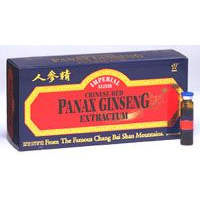 We make our liquid Chinese Red ginseng from mature six-year old Panax roots gathered in the world's premier ginseng growing region - the Chang Bai Shan mountains of the China/Korean border. We then process these roots into a liquid to maintain all their wholistic benefits, potency and strength. Our pure ginseng extract is then combined with distilled water and pure honey for a refreshing and nutritional tonic that boosts energy and stamina.